PSALMS 91:11 KJV "For he shall give his angels charge over thee, to keep thee in all thy ways." 8Only with thine eyes shalt thou behold and see the reward of the wicked. 9Because thou hast made the LORD, which is my refuge, even the most High, thy habitation; 10There shall no evil befall thee, neither shall any plague come nigh thy dwelling. 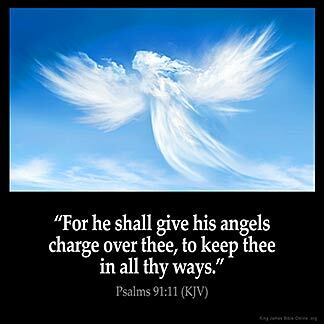 11For he shall give his angels charge over thee, to keep thee in all thy ways. 12They shall bear thee up in their hands, lest thou dash thy foot against a stone. 13Thou shalt tread upon the lion and adder: the young lion and the dragon shalt thou trample under feet. 14Because he hath set his love upon me, therefore will I deliver him: I will set him on high, because he hath known my name. For hee shall giue his Angels charge ouer thee: to keepe thee in all thy wayes. Angels are one of the benefits that God has given to us As I believe and speak God's word they are there to bring it to pass : I have no need to be anxious over anything : If God be for me and He is then what can successfully be against me !!! Mine angel are watching and waiting for the words that we speak to bring it to pass : But if I speak doubt and unbelief they fold their hands for they cannot do doubt and unbelief : Fear and worry : doubt and unbelief will stop all. I Praise God that He has given me the way of salvation to believe and speak and obtain from God all good that God has promised. Nothing is impossible with God !!! When I speak God's word in faith I am doing His word. Just as I clicked on the "e" for my KingJamesBibleOnline homepage to load up, I said "God, I do not think I'm safe here" home and Psalms 91:11 was on the screen. Sometimes God hears us and answers us in a millionth of a second. I just wish I had the instructions on how to get out of here and start over. I think I am so blessed and so are you to have mighty angels assigned to watch over me. thank u you father for caring. we should remember that through our journey on this earth he is there to guide us, for us to get to our destination safely which is our home in heaven. in our trials, problems, temptations, he is there with us to make that we come out victorious.